Very well maintained and sparkling clean home with main level entry and no steps in popular Biltmore Commons gated commy. 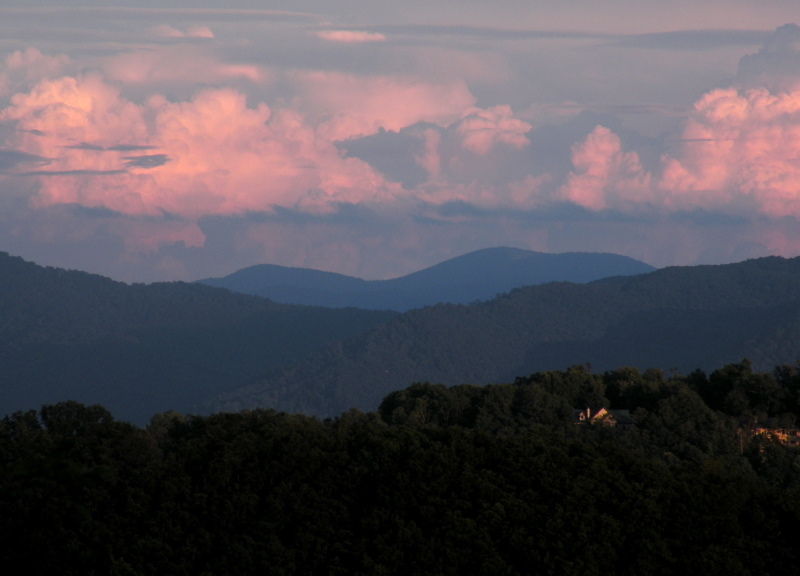 Gorgeous long mountain views from Living Rm, Screened Porch and Master bedroom. Dining has built in china cabinet and spacious living room has gas log fireplace. Newer carpet, gas clothes dryer, efficient Apollo heat system. No dogs in subdivision. Clubhouse, pool and tennis courts. I have a question about the property at 4605 Breakers Lane Asheville NC 28806 (#NCM594773). I would like to schedule a visit for the property at 4605 Breakers Lane Asheville NC 28806 (#NCM594773). Wonderful,private, well maintained upper level end unit, fireplace, community pool, heat pump, covered porches, roomy closets, handicap bathroom. Enjoy the privacy on your covered back porches. Fantastic private unit located away from the road across from the community pool. Move in ready, close to South Asheville shopping and restaurants, Biltmore Park, and within walking distance of schools and South Asheville library. No dogs, cats are okay. I have a question about the property at 118 Cedar Forest Trail Asheville NC 28803 (#3150406). I would like to schedule a visit for the property at 118 Cedar Forest Trail Asheville NC 28803 (#3150406). GREAT INVESTMENT RENTAL or permanent starter home or 2nd vacation home. You decide! Sitting on top of a beautiful knoll is this friendly neighborhood community w pool & clubhouse. 3 BDRM/3BA End unit Townhouse,gas fireplace & garage. It is Bright,with an Open Floor Plan. Only 10 minutes to D/T Asheville, hospitals * shopping and only seconds to the grocery store. Move in Ready! See it Now! I have a question about the property at 94 Rotunda Circle Asheville NC 28806 (#NCM541560). I would like to schedule a visit for the property at 94 Rotunda Circle Asheville NC 28806 (#NCM541560). MULTIPLE OFFERS! HIGHEST/BEST DUE BY 11/13 @ 1pm. Foreclosure- 3 bedroom / 2.5 bath on .49ac (home is in flood plain). Needs TLC. Desirable neighborhood, in-ground pool (condition unknown). 1895 sqft, 2 car garage, level yard. All offers must be accompanied by attached addenda, prequal or proof of funds, EM must be certified upon acceptance. Seller/LA make no representations. BA to confirm all info. Sold as-is. I have a question about the property at 6 TRAPPERS RUN DRIVE Asheville NC 28805 (#NCM523279). I would like to schedule a visit for the property at 6 TRAPPERS RUN DRIVE Asheville NC 28805 (#NCM523279). This property is priced to sell and being sold "AS-IS". A bonus room can be used as an office or a bedroom. Large living room space connected to the bonus room. Half bath has plumbing for a shower. Garage has space to store motorcycles or bikes. Nice fenced yard. Corner lot. Seller's father built this home. I have a question about the property at 4 Brickyard Drive Asheville NC 28806 (#3342504). I would like to schedule a visit for the property at 4 Brickyard Drive Asheville NC 28806 (#3342504). Come home to this clean and well kept home on a nice large lot. Conveniently located not far from downtown and the River Arts District, this property offers a lot for the price. Move right in and enjoy the open floor plan and the large covered deck - just perfect for entertaining - or prepare a gourmet meal in the large and open kitchen. There's even an outbuilding for extra storage. If you're looking to save AND get a great home then you need to call today! I have a question about the property at 102 Adams Hill Road Asheville NC 28806 (#3226850). I would like to schedule a visit for the property at 102 Adams Hill Road Asheville NC 28806 (#3226850). Views & More Views! The homesite looks west and south onto beautiful mountain views. This well-built Clayton home features an open floor plan with breakfast bar, dining room and separate dinette area. The kitchen has plenty of counter-space, lovely cabinetry & built-in microwave, electric range/self-cleaning oven. Refrigerator is included. The living room has a stylish ceiling fan. The master bedroom & attached bath are spacious with a walk-in closet. Washer/Dryer in the mud room are included. I have a question about the property at 239 Cowan Cove Road Asheville NC 28806 (#3216022). I would like to schedule a visit for the property at 239 Cowan Cove Road Asheville NC 28806 (#3216022). Great opportunity in popular Bent Creek subdivision. Three bedroom, 2 bath, ranch style home in need of tender loving care. Living room, eat-in kitchen & family room with fireplace/woodstove. Deep single car garage & partially fenced yard. Home being sold "AS IS". I have a question about the property at 285 FOXCROFT DRIVE Asheville NC 28806 (#NCM520358). I would like to schedule a visit for the property at 285 FOXCROFT DRIVE Asheville NC 28806 (#NCM520358). Cute 2 bedroom/1 bath bungalow in Oakley w/in walking distance of the elementary school. Other features of the home include wood floor throughout most of the home, galley kitchen, fenced yard, covered front and back porches, and a level yard. Ready for new owners to move in and make it their own! Seller/Agent make no representations. MLS info not guaranteed. Please review attached offer instructions. I have a question about the property at 80 School Rd E Asheville NC 28803 (#NCM563551). I would like to schedule a visit for the property at 80 School Rd E Asheville NC 28803 (#NCM563551). I have a question about the property at 21 WAGON ROAD Asheville NC 28805 (#NCM565618). I would like to schedule a visit for the property at 21 WAGON ROAD Asheville NC 28805 (#NCM565618). I have a question about the property at 57 ADAMS STREET Asheville NC 28801 (#NCM557551). I would like to schedule a visit for the property at 57 ADAMS STREET Asheville NC 28801 (#NCM557551). Ranch style home with covered front porch. Hardwood floors in living room, hall and all bedrooms. Eat-in kitchen leads to expansive covered back deck, perfect for outdoor entertaining & enjoyment. Family Room with Monitor Heat & large laundry room downstairs connects to tandem garage. Home needs some TLS, interior work. Listing Sold by Asheville Real Estate Co. I have a question about the property at 18 CEDAR HILL ROAD Asheville NC 28806 (#NCM546806). I would like to schedule a visit for the property at 18 CEDAR HILL ROAD Asheville NC 28806 (#NCM546806). Great investment opportunity! 3 bedroom home with character and charm, in need of some work. Brick fireplace, formal dining room, plus a 1 bedroom apartment for rental income. Spacious rooms with high ceilings. Walk to West Asheville bakeries, restaurants and shops. Possibility of subdividing lot. SOLD AS IS! I have a question about the property at 129 ALABAMA AVENUE Asheville NC 28806 (#NCM543338). I would like to schedule a visit for the property at 129 ALABAMA AVENUE Asheville NC 28806 (#NCM543338). 2 for 1 DEAL!!! Firm on price for home on 0.17 acres and 0.16 acre adjacent lot all together 0.33 acres!-Artsy Bungalow 5 minutes to UNCA & less than 10 min to downtown AVL. Cute-as-can-be & cozy with lots of updates: hardwood floors throughout; tile in kitchen, bathroom, laundry; ceiling fans. New natural gas furnace (Oct 2012). Propane gas log fireplace. A great rental investment!!! (rents for $850/month). Owner is realtor. Many updates -As Is. I have a question about the property at 223 Elk Mountain Road Asheville NC 28804 (#NCM572991). I would like to schedule a visit for the property at 223 Elk Mountain Road Asheville NC 28804 (#NCM572991). I have a question about the property at 312 Heather Court Asheville NC 28804 (#NCM540439). I would like to schedule a visit for the property at 312 Heather Court Asheville NC 28804 (#NCM540439). Blocks from downtown, walk to the YWCA... handy man special. Great rehab opportunity; attractive lot with City and mountain views. Subject is tract 1, PB 124, Pg 47...and part of DB 3854, Pg 352. Will require CO for reoccupancy. I have a question about the property at 275 South French Broad Asheville NC 28801 (#NCM539180). I would like to schedule a visit for the property at 275 South French Broad Asheville NC 28801 (#NCM539180). Brand New Carpet and Paint! Fresh and Ready to Go and Show! Wonderful Neighborhood so close to downtown yet just outside city limits. Partially fenced back yard for privacy and plenty of level yard for play. Huge back deck for entertaining. 2006 construction with a few extras that make this home a must see! I have a question about the property at 133 PORTER ROAD Asheville NC 28803 (#NCM505776). I would like to schedule a visit for the property at 133 PORTER ROAD Asheville NC 28803 (#NCM505776). Move-in ready, affordable & close to everything! Great opportunity for first time buyers or investors. This home has new paint, fixtures & flooring. The large living room features a wood burning fireplace & opens to an eat-in kitchen. Split bedroom plan has large master suite with walk-in closet & updated bath. Ideal location to walk to Sunny Point, the Admiral, West End Bakery or zip downtown. Home rents for $1,200 a month. Hurry for this deal! I have a question about the property at 77 Baker Avenue Asheville NC 28806 (#NCM531088). I would like to schedule a visit for the property at 77 Baker Avenue Asheville NC 28806 (#NCM531088). One-level living with some updates including heat pump, insulated windows, tile in baths, refinished HW floors in LR/DR. Additional bonus room on rear of home with full bath, could be 4th BR, or makes nice family room. Kitchen opens to living area with brick fireplace/wood stove insert. Large carport main level with additional detached Garage/Workshop in rear w/excellent storage area underneath. Good solid house in convenient area of nice homes! I have a question about the property at 8 Thomas Street Asheville NC 28806 (#NCM509151). I would like to schedule a visit for the property at 8 Thomas Street Asheville NC 28806 (#NCM509151). I have a question about the property at 104 Bull Mountain Road Asheville NC 28805 (#NCM558126). I would like to schedule a visit for the property at 104 Bull Mountain Road Asheville NC 28805 (#NCM558126). Totally remodeled home minutes from the hospital and downtown Asheville. This super convenient home is looking great! H/w floors throughout, a brand new heat pump and a gorgeous kitchen. Sits on a nice lot with an outbuilding, this home is priced to sell. Come see! I have a question about the property at 711 Reed Street Asheville NC 28803 (#NCM532897). I would like to schedule a visit for the property at 711 Reed Street Asheville NC 28803 (#NCM532897). 3/2 Single wide on 4.9 acres with additional rental lot. Two storage buildings(1 20x20 and 1 30x30) 30x30 storage has power. Plenty of pasture area for mini farm or gardening. Property has great views and a small brook. Tenant owned mobile home on the rented lot. Please no drive byes. I have a question about the property at 127 Shope Road Asheville NC 28805 (#NCM583356). I would like to schedule a visit for the property at 127 Shope Road Asheville NC 28805 (#NCM583356). Great possibilities in the Oakley area. 3 bedroom home is situated on a larger lot in this popular area of town. You can look out over the backyard from the covered deck. Hardwood floors are hiding under the carpet. Newer windows (2009) and a new roof will protect you from the elements. Renovated homes in the area are selling for almost twice as much! Live close to Biltmore Village, Asheville Mall and all those areas have to offer. I have a question about the property at 39 Shannon Dr Asheville NC 28803 (#NCM591755). I would like to schedule a visit for the property at 39 Shannon Dr Asheville NC 28803 (#NCM591755). 2000+ SQ FT ON 1+ ACRES WITH MOUNTAIN VIEWS, A CREEK AND AN ASHEVILLE ADDRESS ALL FOR < $120K! Well maintained home with lots of space for the money! Large master with sitting area and master bath with jetted tub, separate shower, double vanity and huge walk in closet. Offers both a formal living room and a family room that boasts a stone surround fireplace. Very large kitchen and dining combo with island. Separate mudroom/laundry off kitchen. I have a question about the property at 751 Starnes Cove Asheville NC 28806 (#NCM579422). I would like to schedule a visit for the property at 751 Starnes Cove Asheville NC 28806 (#NCM579422). 3 bed, 2 bath home with a 2 car garage in North Asheville for under $150K. This home has hardwood floors, a split floor plan and a semi-private backyard for enjoying. A fully fenced in backyard, and minutes to shopping and downtown Asheville. I have a question about the property at 26 Clarendon Ave. Asheville NC 28804 (#NCM591715). I would like to schedule a visit for the property at 26 Clarendon Ave. Asheville NC 28804 (#NCM591715).